Bronson Dorsey is a retired architect and professional architectural photographer who lives in Austin. Since 2009, in addition to working with photography clients, he has traveled the state searching for and photographing abandoned buildings. Dorsey also has a companion site to this book at www.lost-texas.com. 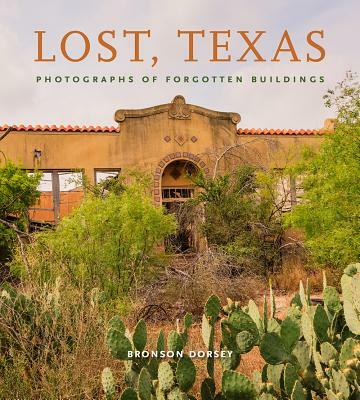 In Lost, Texas: Photographs of Forgotten Buildings, Bronson Dorsey takes us on a tour of old, abandoned buildings in Texas that evoke the mystique of bygone days and shifting population patterns. With a skilled photographer’s eye, he captures the character of these buildings, mostly tucked away in the far corners of rural Texas—though, surprisingly, some of his finds are in the midst of thriving communities, even, in one case, the Dallas metroplex. Most of the buildings are abandoned and in a state of decay, though a handful have been repurposed as museums, residences, or other functional structures. Encompassing all regions of the state, from the Piney Woods to the Panhandle, the images in Lost, Texas evoke distinctive memories of the past. They grant a sense of how those who preceded us lived and how the Texas of earlier days became the Texas of today. Some of the historic sites include a Coca-Cola bottling plant in Beeville, a lumberyard built over two generations, a beautiful, mission-style schoolhouse raised in a small farming community, the skeleton of a boomtown gas station near the Yates oilfield, and what remains of the only silver mining operation in Texas. With Dorsey as a guide, readers may explore these hidden and neglected gems and learn the basic facts of their origins and intended uses, as well as the principal reasons for their demise. Along the way and in the background, he quietly makes the case for preserving these buildings that, while no longer central to the ongoing function of their communities, still serve as important emblems of the past.